Using this setup you’ll be able to record studio moments, plus live stream to Facebook, Periscope and more. Obviously, the most important bit is your studio webcams. All of this list can be adjusted to fit your budget. For example, you can buy 7 cameras and spend more money, or keep it to one. You can also buy some trendy big cameras, but these webcams are perfect too. I’ve personally worked with the Logitech C920 HD Pro, and at the price, currently on Amazon, you can’t argue with the balance between quality and price. These studio webcams are full HD, a great price, and all USB and easy to install. One of the other benefits is they have a tripod screw on the bottom of each one. This means you can buy some tripods or wall mounts for some great angles. In order to get your on-air output audio into the video recording, you’ll need a connection to the computer running it all. Using the iRig 2 Interface you’re able to connect whatever you hear in your headphones to a PC. All you’ll need is a spare headphone port and a normal 6.35mm jack to jack cable. Simple plug the iRig 2 Interface onto the other end of the jack and then into your computer. One of the other benefits of this is that it uses the audio going into your headphones. So, if you’re live on Facebook and your pre-fade your microphone, you can talk directly to viewers without the studio output playing. This is great for creating a mini-show that people watch for the exclusive off-air bits. One of the coolest parts of this setup is the most expensive part of most studio camera kits is actually totally free. OBS, or Open Broadcast Software, is a free piece of software that allows you to create a virtual TV studio on your computer. You’re able to set up different scenes to cut to, such as Presenter 1, Presenter 2 camera switching. It’s really easy to use, plus with its open source community, you can often get a lot of plugins to help maximize the power of the setup. The setup of it all is surprisingly easy. Simply plug the Logitech C920 HD Pro into the computer you’re using, and the iRig 2 Interface into the headphone jack. You’ll then need to setup your scenes. 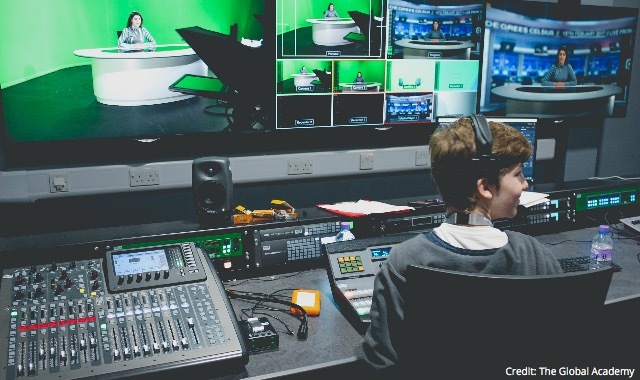 For each scene, you’ll need to add the webcam as a source and the on-air output as the source. Hotkeys are useful to set up too, so you can switch between each presenter fast. In the settings of OBS you can mess with recording format, audio delay (depending on your station studio you may need to delay the audio to sync), plus more bits to customise the experience. If you’ve got any issues setting this up, I’ve probably faced it already and have the easy answer. Feel free to ping me an email and we can chat through it all!